If knowing where you want to be, and establishing your personal vision, is the first step in any personal development, the next step is to understand where you are now. From this point, you can work out which areas are likely to need some work to improve your skills and abilities. Being aware of your weaknesses enables you to take steps to start to address them. These steps may be through formal courses, working out how to use and apply your existing experience in a different way, or using everyday experiences and setbacks as a way to learn. Being aware of your strengths and weaknesses - and, indeed, wider self-awareness - is a crucial part of emotional intelligence. Without a good understanding of yourself, it is very hard to either improve, or to respond effectively to others. Cultivating habits of reflection, self-awareness and understanding is therefore important for relationships throughout life. There is more about this on our page: Self-Awareness. Don’t forget your strong points! In identifying areas to work on, it is also important to recognise your strong points: where you already have very good skills or some particular expertise. b)	To identify where you might be able to draw on previous experience to develop new skills. Some experts recommend a long list of things that you are good at, and a much shorter list of only four or five areas for development. This helps you to remain positive. If you are struggling to know where to start with your strengths and weaknesses, you may want to try our Interpersonal Skills Self-Assessment, or our quiz on What Kind of a Leader Are You? It is also helpful to ask colleagues and friends if they think there are areas where you are particularly strong or weak. It can be difficult for people to give you feedback about strengths and weaknesses face-to-face, especially at short notice. It may feel like they are over-praising you, or picking holes in you, and people do not like to do either of those things. Explain what you want ahead of time, and ask if people are prepared to talk to you honestly. If possible, give them some areas to focus on (for example, you would like to know more about how you come across to other people, or what it is like to work with you). You will need to respect their decision if they prefer not to comment. Set up a one-to-one discussion over a coffee, having given them enough time to prepare. Ask a trusted friend to collate written feedback anonymously. If you go down this route, you may find that a useful format is ‘Keep, Stop, Start’. Here, you ask people to give two or three comments on things that you should keep doing, stop doing and start doing. Once you have identified the broad area of weakness or challenge that you want to work on, it can be helpful to dig a bit deeper. There are a number of ‘levels’ on which any problem can be expressed, and these will need to be addressed in different ways. Our page on Dilts’ Logical Levels explains that there are a number of ‘logical levels’ that provide a helpful structure in which to look at problems or change. The idea is that each level affects those below, and is affected by those above. If you want to change something, you therefore need to understand the level at which it operates. Identifying the level of the problem can help you to frame both it and a solution more effectively. The key is to address the problem at the level at which you have framed it. If you have framed it as being about your identity, it is no good trying to address it by going somewhere quiet to help you concentrate. Instead, you need to think about why you have those views about ‘people like you’, and try to unpack that a little. You have now, therefore, identified some weaknesses, and also worked out at what level you have framed the problem, and the need for change. The final step in identifying what to work on is to focus on what matters. It is important to remember that you cannot do everything at once. 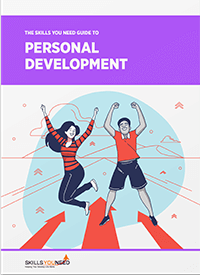 Our page on Planning Your Personal Development explains more about how to prioritise your learning, but the basic idea is to identify the areas that are both most important to you, and most need addressing now if you are to achieve your goals. Your ideal list of areas to address should be four to five key skills or areas of knowledge. Any more, and you will start to feel overwhelmed by the task you have set yourself. As you work on your personal development, you may find yourself feeling a bit negative about yourself, because you have so many things ‘wrong’ with you. It is therefore helpful to keep a longer list of things that you are good at somewhere to hand for those moments. …remember that as you grow and develop, your list of weaknesses and strengths will change. First, you will become better at some things, but secondly, you will identify other areas that now seem important to develop. Keep your personal development under review to ensure that you keep focusing on the most important areas.